There are numerous stories about the origins of this well-known Scottish apple. In essence the variety arose as a seedling, allegedly near the grave of a ploughman who had been shot by a gamekeeper for stealing apples (or perhaps something more valuable). The knobbly skin is indeed a crimson-red colour, and this is also a variety where the flesh can sometimes be stained red as well. Bloody Ploughman is often considered an eating apple in Scotland, but south of the border tends to be regarded as a cooker! Please fill in the details below and we will let you know when Bloody Ploughman apple trees are back in stock. 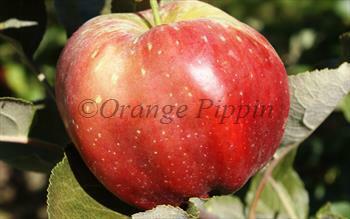 A popular Scottish cooking apple, well-suited to damp wet conditions. Bloody Ploughman is in flowering group 4. Bloody Ploughman is self-sterile and needs to be pollinated by another tree of a different variety nearby. Bloody Ploughman originates from the area around Megginch in the Carse of Gowrie in eastern Scotland. It was first recorded in 1883, and it is rumoured that the original tree is still alive. The Carse of Gowrie is an area of high quality agricultural land between the towns of Perth and Dundee. It has long been associated with fruit-growing, and has one of the best climates in Scotland, with a combination of low rainfall and good levels of sunshine. Whilst the ancestry of Bloody Ploughman is unknown, the story suggests it is most likely a seedling of a local variety.